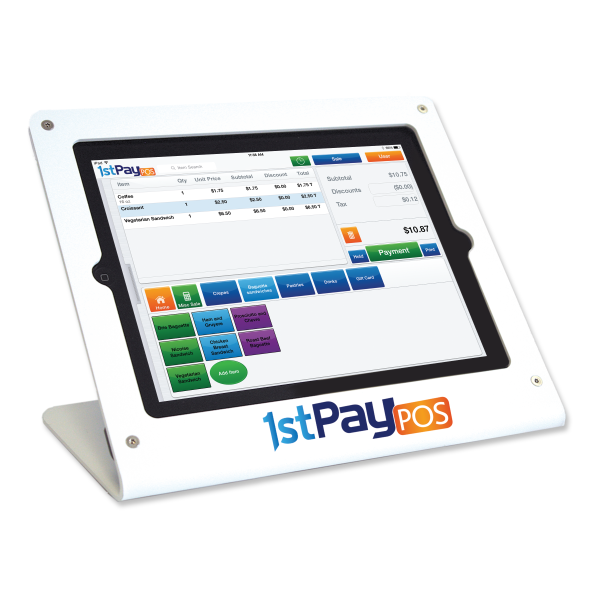 CHERRY HILL, N.J.--(BUSINESS WIRE)--1stPay POS® is a revolutionary iPad® point-of-sale to grow your business and better manage daily operations. The 1stPayPOS® cloud-based iPad POS system provides big data analytics for small-to-medium sized businesses (SMB). “Powerful analytics, robust reporting and management tools can revolutionize a business,” says Tom Fraser, President, 1stPayGateway. The cloud data service allows the business owner the freedom to manage their business from anywhere. Monitor inventory with automated alerts when it’s time to re-order, analyze what is and is not selling, and track margins at the product level. Attract new customers with a loyalty program coming soon. Increase efficiency and improve profitability with integrated payment processing, employee time clock and cash management. Replacing the obsolete electronic cash register with 1stPayPOS® will speed the checkout process with barcode scanners, improve your store’s image and provide analytics to better manage your business. 1stPayPOS® has no servers to maintain and no limit to the number of stations like a PC-based system. 1stPayPOS® has proprietary End-To-End Encryption technologies to offer you peace of mind that your customers’ credit card data is secure. The card data is encrypted at the time of swipe, which is superior technology to that used by the big box retailers currently in the news. 1stPayPOS® is showcased at the TRANSACT 14 conference Powered by ETA in booth # 662B, in the Mobile Zone, and in the March Issue of ETA’s TRANSACTION trends Startup Stories. An urban convenience store in Philadelphia replaced their electronic cash register with 1stPayPOS® and significantly increased profitability. The 1stPayPOS® system provides barcode scanning of products which has increased customer satisfaction with reduced checkout time and vastly improved pricing accuracy. Previously each product had a small price label with “TX” to identify if the product was subject to sales tax. The store sells drinks from a cold case and can’t support a stick on pricing label. The employees love the new system which rings up sales with accurate prices and sales tax and provides integrated cash and credit card processing functions. 1stPayPOS® iPad point-of-sale system enables small-to-medium sized businesses to grow and better manage their business. 1stPayGateway powers 1stPayPOS® and provides proprietary End-to-End Encryption technology, payment tokenization, mobile payment solutions, and payment & donation pages to reduce PCI scope and credit card acceptance risk. Visit www.1stPayGateway.Net or call 888-417-8729 to learn more and follow us on Facebook, Google+, LinkedIn and @1stPayGateway for updates.